A few attractive alternatives for income investors looking for a better dividend than Mickey D's offers. After two straight years of lagging the market, McDonald's (NYSE:MCD) is back in Wall Street's win column: The stock is up 31% in the last year. A return to sales growth has investors feeling better about the fast food chain's business, but the flip side to that optimism is that McDonald's yield is lower now than it has been at any time since early 2012. Half of the members of the Dow pay out a higher yield these days, and many are growing at a significantly faster pace. So today, I'll spotlight two blue chip alternatives that income investors might prefer to Mickey D's today: Procter & Gamble (NYSE:PG) and Nike (NYSE:NKE). Data source: Company financial filings and S&P Global Market Intelligence. 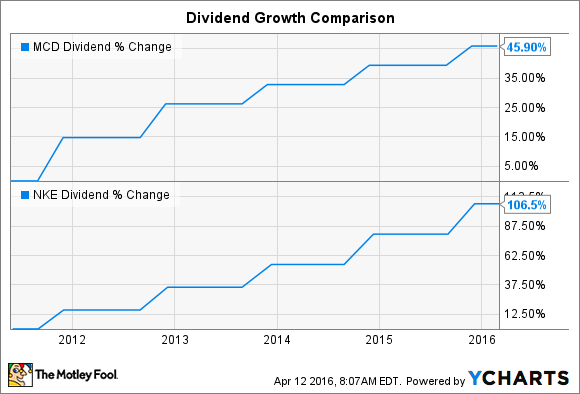 Procter & Gamble's dividend appears to have two big strikes against it. First, the payout's growth rate is tiny. The raise announced this week was just 1% (compared to McDonald's 5%), and that follows a minor 3% uptick in the prior fiscal year. Second, P&G's 85% payout ratio is above the fast-food chain's 72%, and far higher than the market's average of 50% of earnings. Yet the consumer goods titan is in a stronger financial position than its reported earnings growth implies. Profits are being held back by two negative trends (foreign currency swings and brand divestments) that are temporary. Once exchange rates stop their unfavorable moves, and once P&G is done trimming down its product portfolio, profit growth should speed up, pushing the dividend higher as well. In the same way that McDonald's is raising cash by selling its store locations to franchisees, P&G is filling its coffers by removing less-profitable brands from its catalog. Not only should the resulting company be a faster-growing, more profitable enterprise, but the new funds ensure that a mountain of cash returns is headed to shareholders over the next few years. Meanwhile, P&G's improving profit picture is already starting to bring its payout ratio back down to manageable levels: It should come in at 70% for the fiscal year that ends in August, compared to over 100% in fiscal 2015. Investors willing to wait for a heftier payout might consider Nike. The footwear and apparel king is still very much in growth mode, paying out less than one-third of earnings for a dividend yield that's among the Dow's lowest. Higher spending priorities at the moment include expanding into China and innovating around wearable fitness technology. But if operating trends continue at anything like their current rate, the effective yield on shares purchased today will be significantly higher in a few years. Sure, the fact that Nike has aggressive growth plans (to improve sales at a double-digit pace through 2020) while McDonald's is scaling back its own operations means that shareholders aren't likely to see Nike's payout ratio climbing up toward 50% of earnings anytime soon. However, if profit growth can power even a few more significant raises, then income investors are likely to be rewarded with high-quality growth and market-thumping dividends down the line.